Consider the internet and its potential to connect everyone. This is nothing new, says Christine Keneally. Language, she maintains, is the “first virtual world” where we are online all the time. It is unclear how we got there. Language is in our minds, our conversations, and our perceptions. It can be preserved in writing, recordings, and in any medium accessible to the senses. It stores and is stored by memory. It is a medium for sharing that is itself shared. It never stays the same. If it is something to have, we all have it. If it is something to do, we all do it. We humans. How did this come about? The First Word is a comprehensive survey of the tantalizing ways researchers have failed to answer that question. There has been much debate over the question itself. 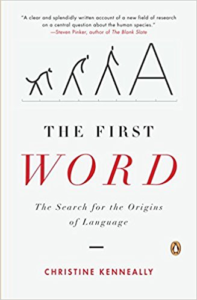 For much of the 20th century academic research into the origins of language was outlawed because Noam Chomsky, “the father of modern linguistics,” deemed it unanswerable and therefore irrelevant. The idea that language is “what makes us human” has made a lot of people feel comfortable about their place among the planet’s living things, but it’s a notion that has fallen apart in a proliferation of animal studies since the 1980s. Whole menageries of creatures have shown themselves capable of communication more complex and subtle than mere birdchirp and distress cries. It has become harder and harder to find the exact set of distinctions that set human language apart from all others. Early hopes that science would find a “language organ” exclusive to humans were ultimately dashed by modern neuroscience. Evolutionary studies had already shown that the parts of the body we most associate with speech—the tongue, larynx, and lips—have functions essential to eating and breathing. Language is far deeper and trickier than knowing what words mean and how to string them together. Some theorists believe that all of the cognitive power that underlies the use of language developed through the use of gestures. Where, then, do words fit in? What are the building-blocks of language? Michael Tomasello is the researcher most known for pointing out that before there can be communication, one party must think that the other party is saying something. It is straightforward to imagine why a creature would be attuned to the whole range of information that arrives by way of the senses. A different order of cognition is required, however, for one creature to have the idea that another creature not only thinks, but wants to demonstrate what those thoughts are. Many primates who learned to communicate with human language researchers do not communicate with each other. Should we ask who said the first word, or who heard it? To ask about the origins of language, one enters the murky world of evolution. How do various aspects and advantages of language operate in the dance of natural selection? Should a researcher investigate physical attributes and DNA? Or is the key to the evolution of language to be found in the evolution of culture? Does it make sense to think about “proto-languages,” simpler components from which language evolved? Since language leaves no trace in the fossil record, what things can never be known? Language isn’t tidy. Neither is evolution. Perhaps that’s why the study of language evolution is so mind-bogglingly rich. It’s confounding to try to hold all the ideas in your head at one time. With this book in hand you can try.